Has Confidence in Pres.-elect Obama Declined? In 12 days Barack Obama will be sworn in as the 44th President of the United States. He has huge challenges in front of him starting with the crumbling economy and two wars. Hopes are high for him to turn things around and indications are that he will. According to a new Gallup Poll 65% of Americans are confident in President-elect Obama's ability to be a good President. This is down slightly from the 70% approval rating he had a week ago. Last month a CNN Opinion poll found that 82% of Americans approved of how Obama is handling his transition. Since returning from his Hawaiian vacation, Mr. Obama has encountered a couple of bumps in the road. 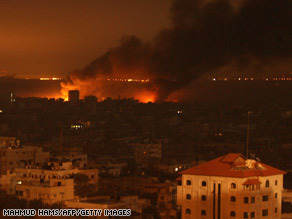 The situation in Gaza (which he's stayed away from by deferring to President Bush), criticism of Leon Panetta as his choice for CIA Director, Bill Richardson withdrawing his nomination for Commerce Secretary, and official stats that the deficit is projected at more than $1.2 Trillion this year. All this before he's even moved into the Oval Office. Here’s my question to you: Has your confidence in President-elect Barack Obama declined any since the election? Does Harry Reid Work for Pres.-elect Obama? "I don't work for Barack Obama. 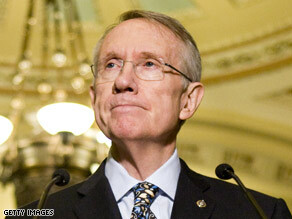 I work with him," Reid said. Senate Majority Leader Harry Reid told The Hill newspaper that the Democrats on Capitol Hill will not be a rubber stamp for President-elect Obama's policies, the way the Republicans have been for President Bush. Reid said, "I don't work for Barack Obama. I work with him." Reid's been on a bit of a roll this week. He started Sunday with his ongoing mantra about President Bush's failures and called him the worst President ever. On Tuesday, he turned away Roland Burris at the Senate door, which was not a surprise since he vowed to refuse to accept anyone appointed by scandal ridden Illinois Governor Rod Blagojevich. But he may not have a choice. Reid met with Burris yesterday and seems to have warmed up to the possibility of seating him if the lawyers can work things out. If that happens, Harry Reid will look sillier than he already does. Reid was also shooting from the lip on the still disputed Minnesota Senate race. He said, quote, "Norm Coleman will never ever serve again in the Senate" Really? What if a court decides otherwise? Yesterday he told his fellow Senators to cancel their travel plans for this weekend and vowed a weekend vote on only the second day of the legislative session. What a busy fellow. Here’s my question to you: Senate Majority Leader Harry Reid says he doesn't work for Barack Obama. Is he right? Are Dems Off to the Right Start? Barack Obama's inauguration is 13 days away. He's not in office yet, and some say the Democrats are off to a rocky start. Senator Dianne Feinstein, incoming Chair of the Senate Intelligence Committee, was quick to publicly complain that she hadn't been notified that President-elect Obama intended to pick Leon Panetta to head the CIA. The Democratic Senate refused to seat Roland Burris yesterday for the office vacated by the President-elect. Nancy Pelosi was talking earlier this week about having to actually be supportive of the President of the United States. She didn't sound overly thrilled with the idea since she likes it best when it's all about her. And Harry Reid is a loose cannon. There's the Rod Blagojevich scandal, the Illinois Governor accused of pay for play politics. Then there’s New Mexico Governor Bill Richardson withdrawing his nomination as secretary of commerce because of an investigation into a campaign donor. Finally, there doesn't seem to be a lot of public statements in support of the new President from members of his own party. Here’s my question to you: Are the Democrats getting off to the right start ahead of Barack Obama's inauguration? How much damage will the Illinois scandal do to President-elect Barack Obama? President-elect Barack Obama's chief of staff, Rahm Emanuel, has been avoiding reporters since news broke Tuesday that Illinois Gov. Rod Blagojevich allegedly tried to sell Obama's seat in the Senate. More specifically, he refuses to answer questions about whether he was the emissary who talked to Blagojevich about the Senate vacancy. The criminal complaint says Blagojevich was willing to appoint Valerie Jarrett, a friend and advisor to Obama, to fill the seat, in exchange for a reward such as a high level appointment. Obama maintains that he nor anyone on his staff had anything to do with the Governor's pay for play politics scheme caught on tape by FBI wire taps. Rahm Emanuel was noticeably absent from a press conference Obama had yesterday. A reporter for the Chicago Sun-Times reports seeing him at Chicago's City Hall yesterday afternoon to watch his kids perform in a school concert. When the reporter asked him directly if he was the advisor named in the criminal complaint, he said, "You're wasting your time, I'm not going to say a word to you. I'm going to do this with my children ..."
Our question is: How much damage will the Illinois scandal do to President-elect Barack Obama? Tune in to the Situation Room at 5pm to see if Jack reads your answer on the air. 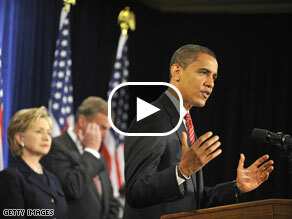 Pres.-Elect Obama assertive with financial crisis, auto industry? The President-Elect insists there's only one President at a time. President-Elect Barack Obama isn't even in office yet and already members of his own party are whining. You'd think after the last eight years they would be so happy to have him on his way to the oval office that they would keep their mouths shut, but no. Some Democrats, including House Financial Services Committee Chairman Barney Frank of Massachusetts, are complaining that they want a more assertive Barack Obama. The President-Elect insists there's only one President at a time, although some say his numerous press conferences and public image suggest he's more presidential than the president. Doesn't matter, members of his own party say he's not being aggressive enough when it comes to critical economic issues facing the country like the potential collapse of the auto industry and the mortgage meltdown. President-Elect Obama called for an extension of unemployment benefits, which passed and has talked about a stimulus package before he takes office. He has also said he wants to help the auto industry. But apparently that's not enough for the whiners. Here’s my question to you: Is President-Elect Obama being assertive enough when it comes to issues like the auto industry and the financial crisis? Should Pres.-Elect Obama scale back inauguration plans? Preparation for Obama's inauguration is already underway in Washington, D.C.
Oprah's going to Washington along with everyone else. The daytime Diva plans to do her television show from the Nation's Capitol during inauguration week. Estimates are that 3 million people may show up for this historic event...the swearing in of the first Black President. The mayor of Washington says it could be as many as 5 million. Some will come to watch and some to celebrate. There will be numerous parties and even formal balls. But according to a CNN opinion poll out today about the economy, 79 percent of Americans say things are going badly in the country right now and 42 percent say the recession is serious. News of layoffs and pleas for government bailouts continue. The bad news about the economy shows no sign of letting up, so is it really time for a huge celebration? 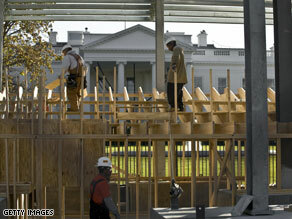 Obama insiders won't reveal any details of the inauguration plans but they tell CNN the party will go on. We just don't know how big a party it will be. Here’s my question to you: Should Barack Obama scale back his inauguration celebration in light of the economic crisis facing the country? Nuclear weapons: What should Obama's first priority be? On Inauguration Day, Barack Obama gets the "football." It's not what you think. This football is the small leather-bound metal briefcase that contains the U.S. nuclear launch codes. It will be handed off to Obama at his swearing in, and from that moment on will go everywhere with him. Think of it as Armageddon in a box. The world is awash in potential nuclear weapons problems right now. North Korea already has them. Iran is racing toward acquiring them. The main nuclear arms reduction treaty with Russia expires next year. And tensions between India and Pakistan are on the rise in the wake of the terror attacks in Mumbai last week. Pakistan is a nuclear power. It's a daunting array of problems for any president to face. So what's inside the football? A secure phone that can connect President Obama to the nuclear command centers at the Pentagon, Colorado Springs and "Site R," a bunkered emergency command center just over the Maryland border in Pennsylvania. Through these centers, the president can reach the 1,300 U.S. strategic nuclear weapons which are always on alert. There is also a list of various attack options, everything from a single shot to an all-out war. Here’s my question to you: When it comes to nuclear weapons, what should Barack Obama's first priority be as president? Mistake for Obama to take "ownership" of financial crisis now? 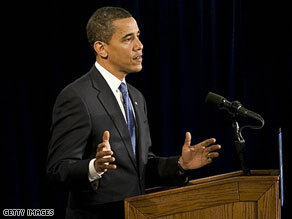 Obama has held two news conferences in two days and unveiled his dream team of economic advisers. 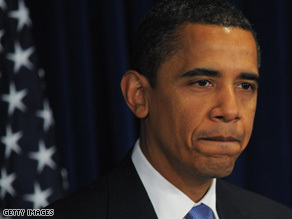 Barack Obama is looking downright presidential these days. He's held two news conferences in two days and unveiled his dream team of economic advisers. He's acting presidential too. As our Gloria Borger writes on CNN.com, "Not only is there a team, but there's also a plan." She says that Barack Obama is taking ownership of the financial crisis. He is ready to tackle it even though he has about two more months to wait until he becomes president. Obama is placing high priority on passing a second stimulus package, which will probably be much larger than the first one, to jump start the economy. It's interesting to recall that during the Democratic primaries, Hillary Clinton derided Barack Obama as not being ready for the job of president. She claimed that while she had years of experience that qualified her to be ready "on day one," Obama had only "a speech" to bring to the office of the president. After Obama whipped her and won the nomination, his Republican opponent, John McCain, picked up Clinton's mantra, saying Obama had no experience and couldn't possibly be ready to assume the highest office in the land. With about 8 weeks to go, Barack Obama is making both of them look rather silly. Here’s my question to you: Is it a mistake for Barack Obama to take "ownership" of the financial crisis more than two months before he becomes president? 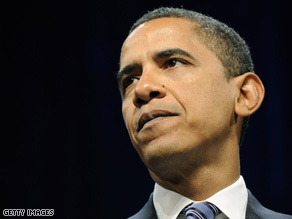 Should Obama hold off raising taxes on wealthy? There are stimulus packages and there are stimulus packages. Remember the one President Bush, House Speaker Pelosi and Senate Majority Leader Reid collaborated on a while back? It was $168 billion and resulted in a few hundred dollars in most people's pockets. It did it's job, gave a short term jolt to the economy, but it's effects are long since gone. And the economy is a whole lot worse now than it was then. Watch: Cafferty: Obama wait on taxes? Stand by for "Stimulus Two!" 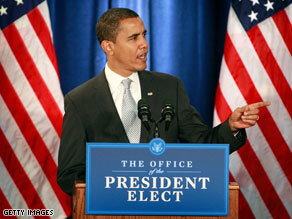 Congressional Democrats say they will have a stimulus package ready for Barack Obama to sign the day he is inaugurated. New York Senator Chuck Schumer told ABC's "This Week," this time the stimulus package could total $700 billion. Gee, another $700 billion. And that's a pretty round number in Washington these days. After all, $700 billion you may remember is what Congress committed last month to bailout troubled financial institutions. It's also an amount slightly higher than what the nation has spent on the war in Iraq over the last 6 years. But it doesn't matter, does it? It's money we don't have anyway, just add it to the national debt. David Axelrod, Obama's chief political adviser, said Sunday that the cost of Obama's economic rescue plan would be pricey. He also hinted that the president-elect may hold off on raising taxes for the wealthy and instead just allow the Bush tax cuts to expire in 2010. Despite Obama's campaign promise to immediately roll back the Bush tax cuts for people making more than $250,000, conventional wisdom says it's never a good idea to raise taxes during an economic slowdown. Here’s my question to you: Should President-Elect Obama hold off raising taxes on the wealthy for two years?